It was an exciting, UK-wide competition with a massive prize, all to celebrate innovation in the UK… And now we can name the winner. Back in July we partnered with TechRadar and Honor to launch a competition, challenging students and recent graduates to come up with a brilliant tech idea. The first prize? A cool £10,000. The competition was part of our Tech Innovation for the Future project, which also included events in Newcastle and London and more than 90 thought-provoking articles posted to our innovation hub. We were searching for new ideas for apps, software services and hardware with the potential to solve real problems and improve people’s lives. The response was fantastic. Entries flooded in from all over the country, leading to some very lively discussions when the judging panel – made up of journalists from T3 and TechRadar – met to choose the winners. The T3 Awards, held at the Ministry of Sound on 27 September, was the venue we picked announce the winner and two runners-up, so that as well as picking up a literally huge cheque, the winners could enjoy entertainment from DJ Yoda and Johnny Borrell, who both played at the event. 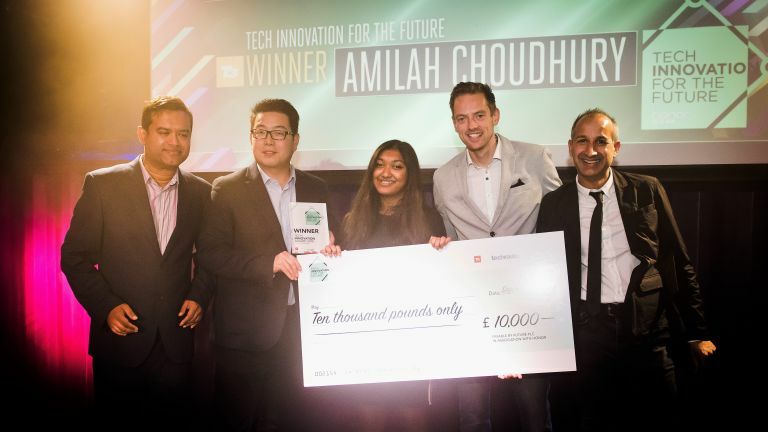 In first place, collecting a prize of £10,000, was Amilah Choudhury from London. Amilah came up with an idea for an app that helps people discover new things to do in their local area. “Some of the best and most rewarding experiences in life come from spontaneity – from discovering, exploring, and revelling in the ambiguity of the unexpected and unknown which this app will help to the consumer to achieve,” Amilah wrote in her entry. The app, which Amelia is calling Seek, would take inputs such as your location, how much time you have, and which methods of transport you can use and then create itineraries of experiences just for you. ThinkActive.io has had two successful run-outs with the Newcastle United Foundation and the team recently deployed the technology in a local high school. Andrew says the next steps are to rapidly expand on three dimensions: regional and national growth in Premier League Football, entrance into Premier League Rugby, and development for health and wellbeing programmes for the workplace. We wish the project the best of luck. In third place, the judges chose SOSight by Suleman Sujad. SOSight is a concept for a free emergency services app which would allow a user to easily contact the police, ambulance, fire department and other rescue services, sending photos or video footage of their location to aid with their rescue. The app would also send the user’s location details to the emergency responder. What a great idea – we’re just surprised that it doesn’t exist already. • We'd like to thank Honor for its support, and of course, everyone who entered. Here's to next year's Innovation for the Future project!